As the capital city for the state of Oklahoma, Oklahoma City has a population of over 638,000 people, according to 2016 statistics. The metro area, larger than the actual city itself, had a population of over 1.2 million people in 2010. Oklahoma City has a median resident age of 34 years old and a median household income of $50,739. In 2012, a state newspaper reported that Oklahoma ranked number one among all US states for prescription painkiller abuse. In 2014, Oklahoma ranked in the top 10 states for drug overdose death rates, according to the CDC. The state of Oklahoma has the second highest rate of incarceration in the country. 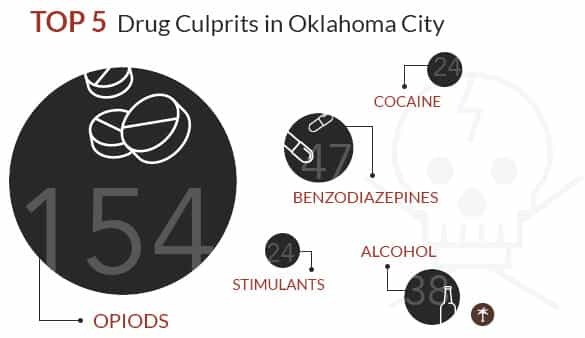 As the largest city in Oklahoma, there are many drug-related incidents and a large number of overdose deaths in Oklahoma City. In 2010, a DAWN report found that there were 211 drug-related deaths in Oklahoma City, with 22 being drug-related suicides. This was about one-third of all drug-related deaths reported for the state of Oklahoma in 2010, which was 638. Most of these deaths involved multiple substances; only 67 involved only one substance. About 46 percent of drug-related deaths were people ages 35 to 54. In 2016, prescription drug abuse in Oklahoma was about 232 percent more than the national average. Based on 2015-2016 national surveys, an estimated 206,000 Oklahoman adults age 18 or older struggled with a substance use disorder, as well as an estimated 14,000 Oklahoman 12- to 17-year-olds. An estimated 187,000 adults and 13,000 adolescents needed but did not get substance use treatment. In 2016, 899 people in Oklahoma died from overdoses, including 435 people who died from prescription opioid-related overdoses. Many overdose deaths in Oklahoma result from polydrug abuse – often, some combination of alcohol, benzodiazepines, and opioids. A 2010 report shows that of the 456 opioid-related deaths, 334 involved more than one drug, which is over 73 percent. The state ranks eleventh in the nation for alcohol poisoning death rate, according to data from 2010 to 2012. Oklahoma is ranked sixth in the US for rate of alcohol-attributable fatalities, with an annual average of 35.9 deaths per 100,000 among all ages between 2006 and 2010. Alcohol-attributable fatalities include deaths from alcoholic cirrhosis, alcohol poisoning, and alcohol-related injuries, as well as deaths from chronic diseases such as heart disease and cancer which can be caused by alcohol. For the chronic conditions, the number of alcohol-attributable deaths was determined based on calculations from studies of what percent of those illnesses are due to alcohol. Rates of marijuana use in Oklahoma are lower than most other states. According to 2015-2016 surveys, approximately 11 percent of Oklahomans aged 12 and up had used marijuana in the past year, which equals an estimated 357,000 people. Neither medical marijuana nor recreational marijuana are legal in Oklahoma. The state does permit the use of high-CBD, low-THC cannabis oil for specific medical conditions if a physician has recommended it, although there is still no legal way to obtain the substance in Oklahoma. 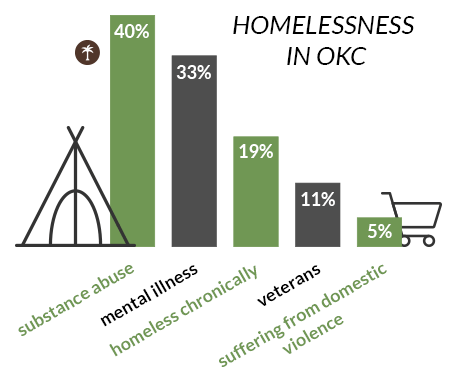 According to a 2018 report, Oklahoma had the 11th worst access to care ranking among the US states, which means seeking treatment for mental illness and substance use disorders can be especially difficult in the state. In both 2015 and 2016, the state had the second highest rate of incarceration in the US and the highest rate of female incarceration in the US. According to a Washington Times article, the majority of imprisoned Oklahoma women on a single-day count in 2015 were nonviolent drug offenders serving their first prison sentence. Almost a fifth of the state’s population lives in Oklahoma City, where resources like government and nonprofit assistance are more accessible than in rural areas. However, many in the city still struggle with substance abuse. In March 2014, one of the deadliest months on record for prescription drug overdoses in Oklahoma, 11 people died from prescription medication overdoses in Oklahoma County alone. Just in that month, 61 people in the state died from overdosing on prescription drugs, an average of two people per day. Castlight Health, a healthcare technology company, found that Oklahoma City ranks 16th in the nation for rates of opioid abuse among people who received an opioid prescription. While the much smaller city Enid, OK outpaces the capital city for opioid abuse rate – 10.2 percent of opioid prescription recipients in Enid compared to 8.0 percent in Oklahoma City – this is still a significant percentage of the population for a major US city. Castlight found that, nationally, baby boomers in the workforce are four times more likely than millennials in the workforce to abuse opioid drugs, and people with a behavioral health diagnoses are three times more likely to abuse opioids. Oklahoma County, with Oklahoma City at its heart, does not lead the state in excessive drinking, but 15 percent of the county’s adults reported binge drinking and/or heavy drinking in the past 30 days according to data from of 2006-2012. Binge drinking was defined as more than four alcoholic beverages in one occasion for women and more than five for men. Heavy drinking was defined as more than one alcoholic drink on average per day for women and more than two on average for men. About 32 percent of driving deaths in Oklahoma County involved impairment from alcohol, according to data from 2009 to 2013. Oklahoma City is part of the North Texas high intensity drug trafficking area (HIDTA). This HIDTA is a key distribution and shipment center for Mexican drug trafficking organizations (DTOs), and although its main distribution center is in the Dallas/Fort Worth area, Oklahoma City also plays a key role. The two main drug threats in the North Texas HIDTA are methamphetamine and cocaine. Although local creation of methamphetamine has gone down recently, the amount brought in by Mexican DTOs has increased. According to the Oklahoma Bureau of Narcotics (OBN), 335 people in Oklahoma died from methamphetamine overdoses in 2016. This was almost an 18 percent increase from 2015 and a 74 percent increase from 2014, showing that meth overdoses are increasing at an alarming rate in the midwestern state. However, the OBN has been working to decrease Oklahoma’s supply of the drug, and their efforts are paying off – in February 2016, they shut down a Mexican DTO cell in Oklahoma City that was reportedly trafficking 100 pounds of crystal meth per week. Young people in Oklahoma also struggle with substance use and abuse. Based on 2015-2016 surveys, about 18 percent of 12- to 20-year-olds reported drinking alcohol in the past month. About 4.9 percent of adolescents aged 12 to 17 and about 32.4 percent of 18- to 25-year-olds participated in binge drinking in the prior month. Binge drinking was defined as, within a couple hours, drinking four or more alcoholic drinks for women and drinking five or more drinks for men. According to the same surveys, an estimated 14,000 Oklahoman adolescents aged 12 to 17 had tried marijuana for the first time in the past year. This is about 38.9 percent of the estimated 36,000 Oklahomans age 12 and up that first used marijuana in the past year. About 11 percent of Oklahoma adolescents reported using marijuana in the past year. About 4.4 percent of Oklahoman adolescents had misused prescription pain medications in the past year. Comparatively, around 0.06 percent used heroin in the past year and about 0.5 percent had used cocaine in the past year. Furthermore, approximately 4.4 percent of Oklahoman adolescents had a substance use disorder in the past year, including almost 3 percent with an illegal drug use disorder, about 2 percent with an alcohol use disorder, and around 0.5 percent with a pain medication use disorder. The fact that these percentages add up to more than 4.4 percent indicate that many Oklahoman adolescents are struggling with more than one substance use disorder. Mission Academy in Oklahoma City is a private high school with a focus on helping teenagers overcome substance abuse and remain sober. Nationally, the long-term recovery rate is 10 to 15 percent for teenagers leaving inpatient addiction treatment; sober high schools across the country boost that rate to between 70 and 80 percent. Sober high schools that also include an alternative peer group program, like Mission Academy does, have rates as high as 90 percent. The higher success of these schools shows the importance of long-term, comprehensive support to help prevent relapse after appropriate treatment. Call now for a FREE insurance and payment consultation. In July 2015, Oklahoma City police announced plans to carry naloxone to try to reduce deaths from opioid overdoses. Naloxone is a medication that, if given in time, can reverse the effects of opioid overdoses. Police in Tulsa, Oklahoma have, since 2014, administered naloxone to 23 people that were believed to be overdosing, and all survived. The OBN, which has headquarters in Oklahoma City, requires healthcare providers to have an OBN registration number. Providers have to be in good standing with the bureau to be able to prescribe opioids and other potentially addictive medications. As a large metro area, Oklahoma City has the main option for Oklahoma’s veterans: the Oklahoma City VA Health Care System, which has a substance abuse clinic to assess, diagnose, and treat veterans with substance use disorders. In an effort to stop the cycle of poverty and incarceration in Oklahoma County, the county has a community sentencing program. This program is court ordered and provides sentenced individuals with treatment, supervision, employment aid, and personal development in lieu of incarceration. Angie’s List, an online listing service, features several options for substance abuse and mental health treatment in Oklahoma City along with reviews, although you have to become a member of the site to see their lists. Vitals is a similar online service that does not require registering with the site, and it has ratings based on user input for addiction specialists in the Oklahoma City metro area. A Chance to Change is a nonprofit that helps individuals struggling with addiction and/or mental illness and their families. In addition to individual, family, and group counseling, they also offer workshops, educational classes, and prevention programs. Although it can be very difficult to conquer a substance use disorder and maintain sobriety, there are several excellent options for help available in Oklahoma. With treatment and determination, long-term recovery is possible.